9-1-1 communications is an important resource that can be the difference between life and death. Last year the Monmouth County Sheriff’s Office Communications Center answered over 170,000 9-1-1 calls. Unfortunately, 27,000 calls were non-emergent in nature. Not only is this life threatening because of limited emergency resources, it is also a cost all taxpayers share. This is a very real concern that which we have the answer: ACES (Adults Calling Emergency Services). Our 30 minute educational and informative presentation includes power point with a video portion and question/answer segment. The program was developed to educate and enlighten adults about the purpose of 9-1-1, how the 9-1-1 system works, and the proper usage of 9-1-1. Communications Division Staff members, PST Kristin Aras and SPST John Cuccia, created and implemented the ACES program with the support and guidance of Undersheriff Ted Freeman and former Sheriff Kim Guadagno. This program is a partnership between the Monmouth County Sheriff’s Office, the Monmouth County Office on Aging and Monmouth County Economic Growth and Development. In October 2008, at the 20th Anniversary National Triad Conference, in Williamsburg, VA, former Sheriff Guadagno and Undersheriff Ted Freeman proudly introduced the ACES program. Presenting the program were PST Kristin Aras and SPST John Cuccia to an audience of over 250 participants which received an overwhelmingly positive response. Former Sheriff Kim Guadagno also announced at the convention, a partnership with the 9-1-1 Cell Bank which will provide the ACES Program to over 3,000 sheriff offices nationwide. In 2000, the Monmouth County Sheriff’s Office began the SEEK program under the direction of former Sheriff Joseph Oxley. SEEK is an acronym, Sheriff’s Emergency Education for Kids. This program is designed to educate children on the proper techniques when calling 911 during an emergency. 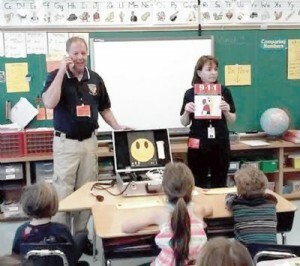 The program which is tailored towards children and taught throughout the school year provides life saving instructions, a video presentation, scenarios, and an interactive session in which the kids practice calling 9-1-1 on an actual telephone. To date, the staff of the Monmouth County Sheriff’s Office—Communications division has educated over 35,000 children ages 5-8. At the end of the program every student receives a 9-1-1 coloring and activity book which reviews everything they learned in our program. Select the link below to view the coloring book in PDF file format.